Home | News | Uncategorized | Celebrating National Surveyors Week-Day 5! No, It’s Not a Camera… So, How Does Land Surveying Work? In our everyday lives, we use all kinds of measuring tools, such as rulers, tape measures, and protractors. For the most part, these tools are great for home projects, but what if we need to layout something bigger like a building, road, bridge, dam, or pipeline? Surveying is the science of taking big measurements. You’ve probably seen the guys on the side of the road looking through a camera-thingy on a tripod. Basically, all civil engineering projects start with a good survey. Surveys determine the legal boundaries between parcels of property. Surveying is also used to determine the location of existing infrastructure, the topography, and the slopes of the land. People have always had a desire for building things, and surveying is a profession full of history and tradition. Behind every wonder of the ancient world was an ancient geometry nerd who laid out the angles and alignments during construction. Surveying is also how we created accurate maps of entire continents like the Great Trigonometrical Survey of India, which took almost 70 years to complete and included the heights of Mount Everest, K2, and Kanchenjunga! The standard survey tool is called a theodolite, and it’s used to measure the horizontal and vertical angles between points. Combine those angles with distances from a chain or tape measure, and you can triangulate the location of any point using trigonometry. Theodolites today, or total stations, can measure angles AND distance, and have onboard computers to calculate and record the data for later use. When you see a surveyor peering through that camera-thingy, it’s probably a total station, and they’re probably sighting a reflector to record the location of a point. For long distances, these measurements have to be corrected for variations in earth’s gravity, refraction by the atmosphere, and even the curvature of the earth. There’s even more sophistication with modern surveying equipment such as GPS and unmanned aircraft (drones). As noted yesterday, surveying is one of the oldest professions in the world, and also one of the most important. Why? Because land is important. If you own land, it’s probably your most valuable asset. 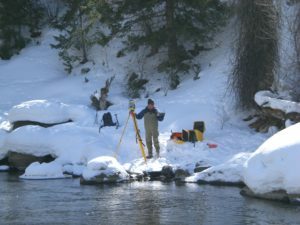 As a career, surveying is a mix of legal knowledge, research savvy, fieldwork, math and geometry, and technical challenges. And since most civil structures are too big for our everyday measuring tools, the surveyor is one of the most important companions for the civil engineer. What Makes Land Surveying Important? Surveyors provide the foundation for sound engineering. The precise information they collect is the starting point for planning projects and developing solutions. National Surveyors Week is this week – March 17-23, 2019. National Surveyors Week’s objective is to raise awareness of the profession through education, media, and public service. In celebration of National Surveyors Week, and the important role surveyors have played in our firm’s success, we polled members of our survey staff to learn more about the profession. Baseline’s surveying team was asked to reflect upon their experiences as surveyors, and answer questions in our “Survey the Surveyors.” See what our surveyors had to say today, our last day this week for our National Surveyors Week celebration. 4. Why should someone consider a career as a surveyor? 5. In your opinion, what types of skills or traits are essential to have as a surveyor?